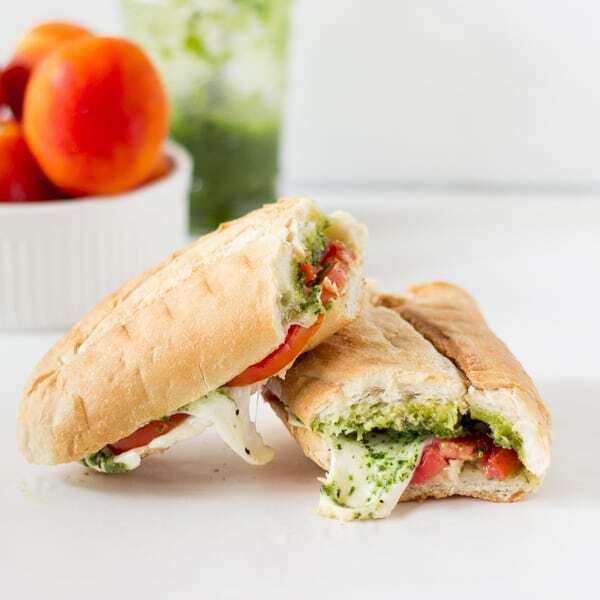 This Caprese Sandwich takes a twist by being toasted with melted mozzarella, and creamy parsley pesto. The sandwich is perfect sor an everyday lunch or a picnic! Well, hello there, almost June! It seems that the official summer month has creeped up on us so quickly, but guess who isn’t complaining! While it’s been literally summer weather all year here, it means being at the beach endlessly will be totally acceptable. It also means, I can post endless summer recipes! The thing is, I need all the excuses I can get to leave the house. This broken leg (sorry if I misled some of you, it still hasn’t healed) has put me in quite a negative mood which can be quite addictive, and for that I have been looking forward to June for a while. I can’t go into the water at the beach, but just sitting by it helps so so much. I used to go to the beach all the time just to relax and perk up my mood, and I think it will be needed more than ever now. I was also looking at my blog content and realised, you’d never be able to tell that I live on a tropical island. That actually, really needs to change! With the Mr.’s help, I plan to be creating a lot more tropical recipes so expect a lot more pineapple, watermelon, mangoes and the likes, and dare I say, actual Jamaican recipes! I had to laugh at myself because a friend asked me for a few Jamaican recipes from my blog, and I found all of three Jamaican recipes. Umm, what?! That needs to change! I’m not trying to be a copycat or just like any blog especially when I have something that sets me apart specifically! So let me take you to the beginning of this beautiful summer month was a sandwich that may not be tropical or Jamaican, but is DEFINITELY bursting with colour and the flavours that I love to associate with summer. This sandwich came about from my obsession with parsley pesto + finding delicious mozzarella cheese, not the shredded version, but the whole ball of mozz cheese, which if you haven’t tried, you need to. The flavour is so much better and a lot less salty from the packaged version! 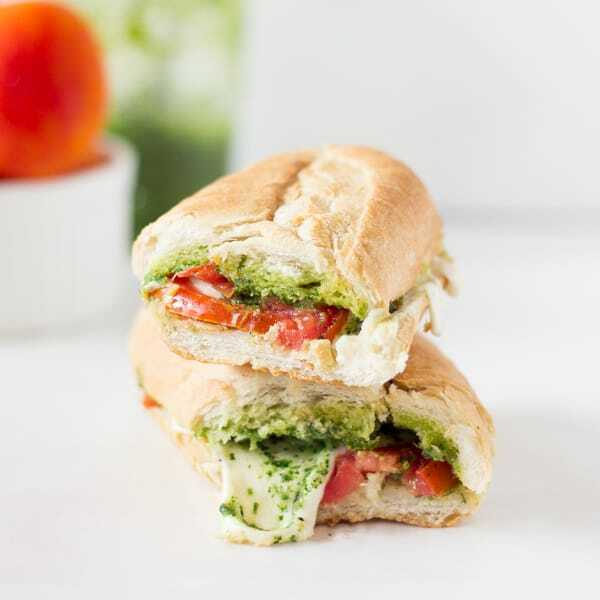 Combined with delicious homegrown tomatoes and parsley pesto and delicious french bread, you couldn’t have a simpler but delicious sandwich. I went on a binge and had this for lunch and dinner for quite a while, mainly in an attempt to have pesto at every single meal (haven’t thought of a breakfast version yet). I considered eating it cold but once I tasted the ingredients heated, decided that this was the way to go. Shall I do the honours? Go ahead, make this sandwich, and dig in. Slice loaf in half. Add mozzarella cheese slices and tomato slices along the bottom of the sandwich. Spread the parsley pesto on the top of the sandwich. Press the sandwich closed. Toast in a panini machine on medium for about 5 minutes, until crispy and cheese is melted. Remove, cut in half and enjoy! This would also taste amazing with my basil pesto and my cashew pea pesto! Oh, I love the idea of more tropical recipes–that would be an awesome reflection of your lifestyle! I’m sorry to hear about the leg, though–chin up, girl, you’ve got some sunshine and great recipes waiting for you! And I hope the smile-thoughts journaling has been going well (I hope I’m not misremembering–that was you, right? 🙂 ). I do love the freshness of this recipe, since it’s always balmy and nice here as well. Cheers, dear! Thanks so much for the motivation Ala 🙂 !! Jessica, I would LOVE to see some Jamaican recipes here. Please please please! Hope your leg gets back to normal very soon … I can imagine how frustrating that must be for you. In the meantime, though, at least you can cheer yourself up a bit by eating more of these beautiful sandwiches. Love your photos! Haha thanks Helen! Sharing very soon! Thanks Marcie and can’t wait to share! 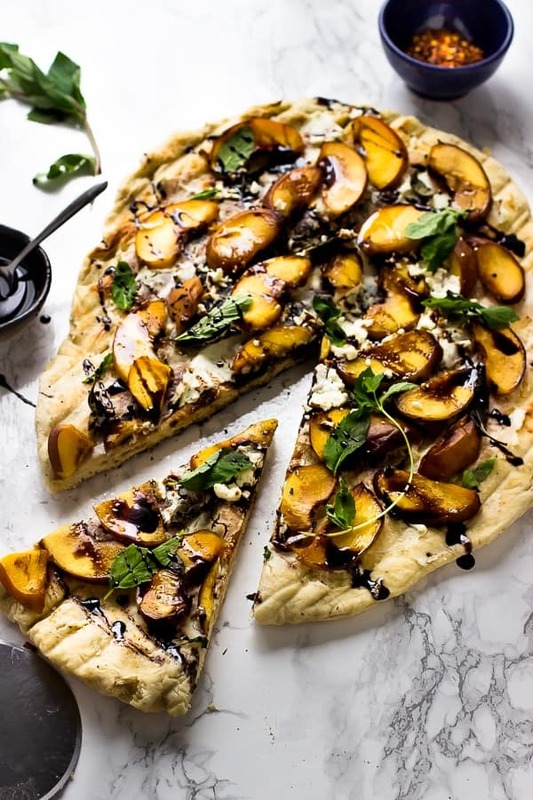 You’ve inspired me to make this for lunch very soon…might have to go with my jarred pesto this time but I’m going to the farmer’s market tomorrow morning and should be able to gather the rest of the ingredients there. Thanks! Ugh, I’m so sorry about your leg!!! You poor thing. 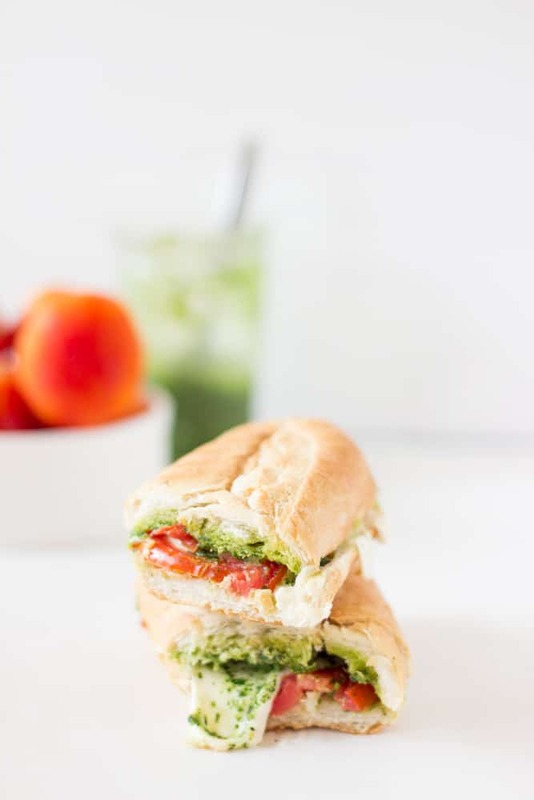 But I’m certain this amazing caprese sandwich put a smile on your face…as it would bring a smile to mine!! Good to see you back! First of all: sorry to hear about your foot! :'( That must be so terrible eek. I really hope you feel better soon Jess! Get well soon & lots of hugs!!! And good luck on your last exams!!! Nice, very nice. I should make this since parsley is more local here than basil! Thanks, beautiful sandwiches….just the way i like them! Thanks Ela! Yes try it out! This sandwich looks AMAZING and so beautiful, I wish the sunlight here was just as good, either that or you have your photos timed for the perfect light, they are gorgeous!!! Hope the leg is healing well and kudos for keeping up with the blog!! Girl that sandwich is amazing!!! The cheese oozing out is everything! GORGEOUUUUUS!!! 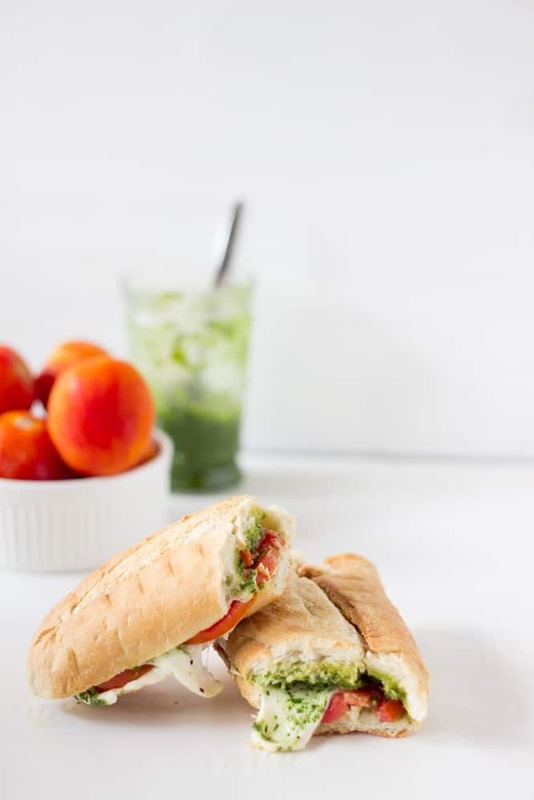 Caprese sandwiches are my favorite and this one is making my mouth water! Aaaw, sorry to hear your leg hasn’t healed yet – I really hope you feel better soon. Oh, yum! This sandwich seems perfect for summer! I love pesto! 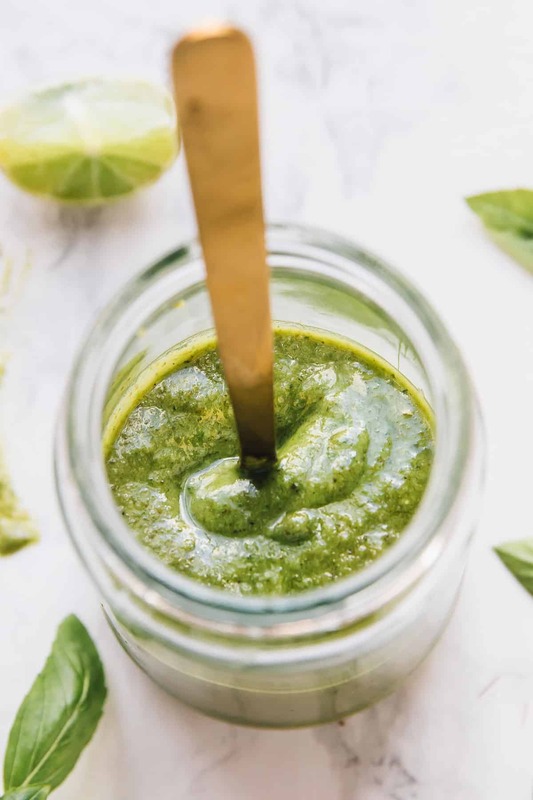 I made a spinach pesto in my ninja that was DELICIOUS! I don’t know why I’ve never made realgur pesto, I think you’re inspired me. I have something I’m going to send you in the mail I’ve been lazy with my mail lately, but you should get it soon! Reblogged this on and commented: Doh! 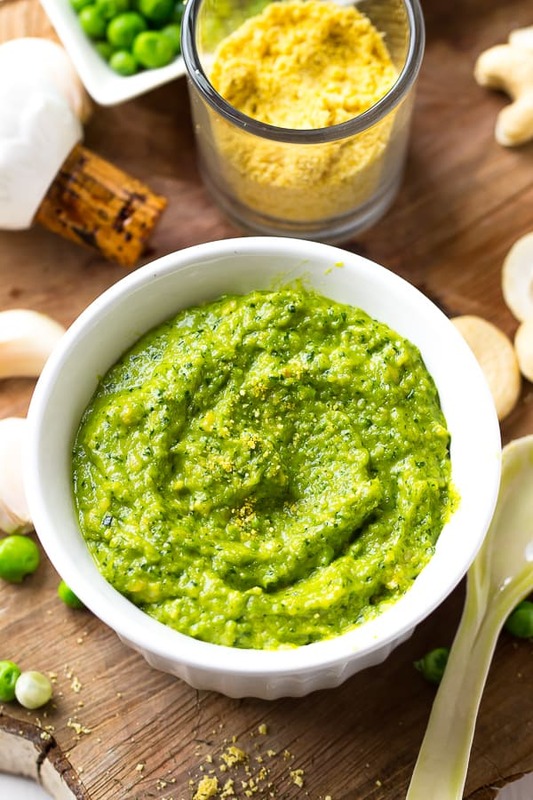 I just reelizad that I forgot one vital element to this pesto recipe NUTS! I love to use pine nuts in my pesto but you really can experiment with all kinds of nuts! To this recipe, add about a 1/4 cup. Amanda it’s me, Judy, your former corowker from school sporting my new last name! I was looking for you on Facebook, but I found this instead. What a cool blog! I’ll be trying your recipes! Just about to make this for lunch, looks so yummy! By the way, a breakfast use for the peso could be an eggs benny (or florentine as I’d make) with grilled tomatoes and the pesto! Yummmm! Great idea Kendra, thank you! I hope you enjoyed it!